BRISTOL SHOW 2013: Ruark Audio MR1 Bluetooth desktop speakers revealed | What Hi-Fi? 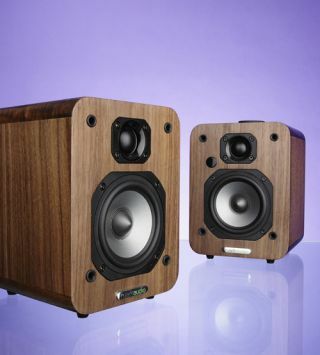 Ruark Audio has launched its MR1 active desktop speakers at this year's Bristol Show. A small, compact pair of speakers, the MR1 speakers can work wirth TVs or as extension speakers for the Ruark R2i and R4i systems. The speakers can also work with Ruark's 'BackPack' rechargeable battery pack, should you want to make the speakers portable. The MR1s use newly-developed drivers and a linear Class A-B stereo amplifier. The Ruark Audio MR1 speakers are set to go on sale in May for around £299.